The Vermilion Cliffs soar 2,000 feet above House Rock Valley and provide a near-impassible barrier to travel, though while there are no official trails, the remote Paria Plateau to the north can be reached by several unmarked routes, all similar in character - they cross the flat land south of the cliffs, rise over steepening, sandy foothills to the base of the main upper section of the cliffs then climb to the rim via narrow gulleys, or cracks. 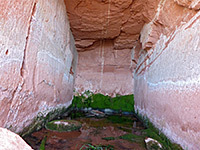 The Bonelli Spring Route is one of the three most used, named after a small but permanent water source 500 feet below the rim, which was known to the ancient Puebloan inhabitants of this region, as shown by petroglyphs on the nearby cliffs, then was developed by more recent settlers (including a man named Bonelli) early in the 20th century. The route is infrequently used and would be difficult to follow as there is no visible sign of any path along the upper half, but its course is now quite evident on account of a black pipe that takes water from the spring all the way down to the valley floor, and parallels the whole of the trail. 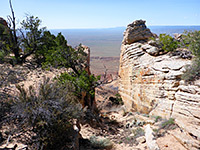 To surmount the uppermost, vertical section of the cliffs involves a sideways traverse, past the spring along a bench, then an ascent of a sandy slope to the base of the narrow crevice that leads to the rim. The full distance is 3.2 miles, gaining 1,840 feet of elevation. Apart from the spring, the petroglyphs and the amazing views from the plateau, other points of interest are pioneer signatures, both around the spring and on the cliffs, a good variety of spring wildflowers, and a few relics on the plateau - concrete water tanks from 1930s livestock operations (supplied via pumping from the spring), and the foundations of some ancient Puebloan dwellings. Bonelli Spring Route topographic map, overview map for Vermilion Cliffs NM. 21 views along the route. View from the top of the cliffs. Full screen version (27 mb). The closest parking spot for the Bonelli Spring hike is 1.5 miles north of US 89A along a narrow track, at a T junction, where it meets another track, the Honeymoon Trail between Jacobs Pool and House Rock Valley Road. 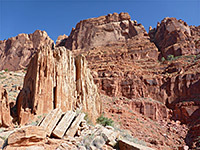 The old road continues northwards but the junction marks the boundary of the Paria Canyon-Vermilion Cliffs Wilderness Area, hence vehicles are not permitted beyond. The initial track has a high center line in places, and crosses some patches of soft sand, though it should be accessible to most vehicles. The track starts along the highway between mileposts 560 and 561; the junction is not obvious, since the road first runs right next to the highway, westwards a short distance, passes through a gate in the roadside fence then turns back 180 degrees and parallels the fence for a few hundred feet before bending north towards the cliffs. Good, primitive camping places can be found a little way south along the nearby Buffalo Ranch Road, a wider, gravel route. The northwards track is not signposted, in common with most of the few roads off US 89A. From the T-junction, the first 1.5 miles of the route is along the continuation track, closed to vehicles - this climbs gently to a low, stony hill, then descends into a grassy basin containing some water tanks, filled via the black pipe that leads all the way to the spring. A fainter track continues northwards a way, soon crossing a dry wash and ending on a little ridge. The pipe runs from here long the west side of another wash which leads towards barren, clayish hills of the Chinle Formation, beyond which is a much steeper slope. The pipe rises up a ridge between the main branch of the wash to the east and a lesser ravine to the west; the easiest route seems to be up this latter ravine. Above the slope is a flatter, sandy area, followed by more steepening hillsides as the pipe climbs a broad ridge between two shallow ravines, aiming for a conspicuous group of three cottonwood trees just west of the spring, at the site of a smaller water source. 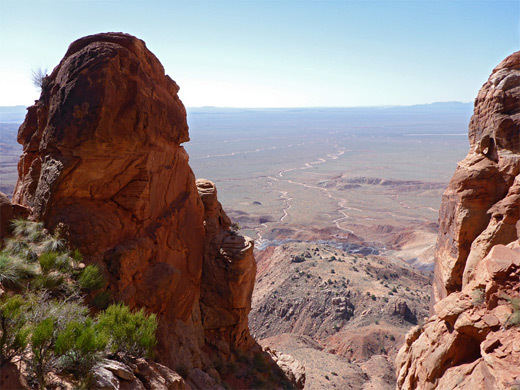 At the top of the slope are two bands of low cliffs, split by cracks that provide scrambling routes up, after which a short eastwards traverse, passing just below the cottonwoods, leads to the spring, at the head of a sandy gulley. The spring was originally just a seep but was enlarged around 1920 by blasting a short tunnel into the cliffs, square in cross-section, and now the water covers most of the floor to a depth of several inches. A metal grill is loosely fixed at the entrance to keep out animals. Early inscriptions on the wall include Ben Hamblin and Earl Sorensen; most are from more recent times. 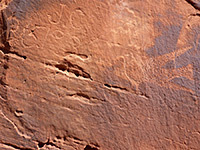 The route proceeds east, along the base of a slightly taller line of cliffs until they end, then directly up a boulder-covered slope to the foot of the uppermost section of the main cliffs, here covered in dark patina, adorned with ancient petroglyphs mixed with more 20th-century signatures. The old trail now moves back west, up another sandy, bouldery slope that rises most of the way to the top, leading to the base of the crack that accesses the final hundred feet, up to the flat, bushy plateau. The concrete tanks are about 200 feet north of the edge, while just beyond is the end of a vehicle track that provides 4WD access to this area, starting in Corral Valley, along House Rock Valley Road. 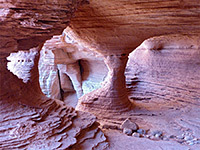 The edge of the plateau is lined with nicely eroded formations of thin-layered Navajo sandstone, and split by many other cracks, large and small. 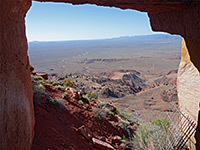 Above Bonelli Spring, the western horizon including the Kaibab Plateau is partly obscured by a southwards-projecting promontory, but a walk of a quarter of mile west reaches a somewhat better viewpoint.